You doubt that high taxes matter? Then visit Monaco. A small strip of land, 0.78 square mile, inhabited by some 30,000 residents, flourishes as a tax haven. The little principality levies no income tax on individuals, no capital gains tax, and no inheritance tax on direct family line members. It assesses value-added tax on purchases, social insurance tax on employees, and a modest stamp tax on the sale of a business or real estate. As a refuge from high taxes, Monaco became famous when Bjorn Borg and Ingmar Bergman decamped from Sweden for Monaco. So many others have taken up residence in Monaco for tax purposes that the principality reclaimed 374,157 square meters of land on which to build more apartments. To gain residency in Monaco, one has to live there six months a year. Monaco has plans for another 275,000 square meters when the global economy recovers. Modest apartments rent for $10,000 a month and higher for larger units. Purchase prices for small units run in the millions. Have a look at the benefits high tax states provide for low tax territories. News of the day is that China has built the world’s fastest supercomputer, supplanting the U.S. as number one in this important field of high technology. Also, China will pass the U.S. and Japan with the largest number of patents in 2011. Both these trends will continue, and in other fields of scientific and productive endeavor. End the Mortgage Interest Deduction? Last February, President Barack Obama appointed the National Commission on Fiscal Responsibility and Reform (Bowles-Simpson Commission). Consisting of 18 members, the commission is supposed to report its recommendations to Congress for consideration by December 1, 2010. To balance the budget in 2015, the commission needs to find $1.2 trillion in savings ($240 billion a year). Potential big items are “tax expenditures,” that is, deductions from gross income. Being discussed are the mortgage interest deduction and pretax payments of health-insurance premiums. Reducing or eliminating the mortgage interest deduction and treating health insurance payments as taxable income would raise substantial revenue. The housing and health insurance industries will fiercely lobby against these changes. The housing industry will argue that reducing or ending the mortgage interest deduction will lower housing values by reducing the tax benefit of interest payments. The evidence is questionable. Moreover, the bulk of the benefit goes to upper-income households. 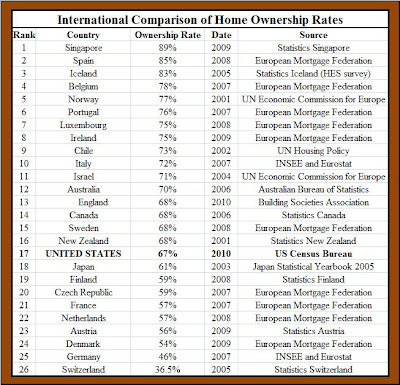 An international comparison of home ownership rates among 26 OECD economies places the U.S. 17th. 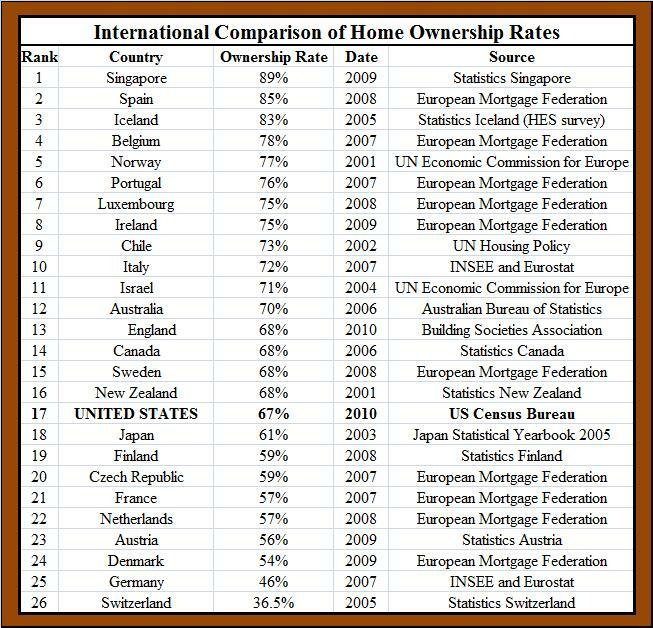 Most of those ranking above the U.S., including England, Australia, Canada, and England, do not permit deduction for mortgage interest. Reducing or ending the mortgage interest deduction is not likely to have a large downward effect on housing values. Indeed, one can argue that the mortgage interest deduction contributed to the subprime crisis by making ownership more attractive than renting. I suggest we also end the tax-free treatment of employer-provided health insurance premiums, expand the expensing provision to all business investment, reduce the AMT to 19%, and apply the AMT to all taxpayers. In so doing, we will have largely made the transition to the flat tax. FBC refers to China, its ability to make everything and provide every service faster, better, and cheaper than any other country. Whether the product or service originates in China, is imported from another country and copied and enhanced, China will make or provide it faster, better, and cheaper. The acronym applies to low-tech and high-tech alike, to agricultural and industrial produce, to wholesale and retail (including financial) services, and increasingly to inflow of foreign investment. I strongly recommend watching the following short video about China in 2030, except that I believe it will occur much faster, as early as 2020. Inflation can be observed and measured in two ways. One is changes in the Consumer Price Index (CPI), a representative basket of goods and services that excludes financial assets, but measures the rental value of owner-occupied housing and rental housing. A second is asset price inflation, which includes changes in the prices of stocks, commodities, houses, and precious metals. The U.S. Federal Reserve Board looks at CPI-based inflation, which is further segregated into core and non-core inflation. Core inflation excludes food and gasoline. The Fed may glance at asset-price inflation, but does not give it the same attention in setting monetary policy. The Fed prints money when it purchases financial assets (quantitative easing). Most analysts forecast another half-trillion or trillion dollars of additional fed purchases in the coming year. Where does (will) this money go? If banks don’t want to lend when they can borrow from the Fed at zero interest and buy long-term treasuries at 4%, why should they undertake more risky lending? If business firms with lots of cash on their balance sheets don’t want to invest, which would mean more jobs, why will additional money matter (so long as the Fed gives the impression that deflation is a bigger risk than inflation)? That leaves precious metals, commodities, and equities to absorb the additional cash, as money will not flow into housing given the foreclosure mess. If this line of thought is correct, by the time fears of deflation have been fully arrested, and the Fed begins to offload the financial assets it has purchased over the past few years, a new bubble may have formed in the financial markets. To arrest that bubble without popping it could be the next exciting adventure in the world of money. One more win for Stanford, one more loss for the San Francisco Forty-Niners, and both could be coming up roses. Barring a major upset, Oregon looks to play in the BCS National Championship game. It doesn’t matter whether it plays Auburn, Boise State, TCU, Mizzou, or some other team. From Stanford’s viewpoint, if Harbaugh with a little bit of luck (Luck) can run the table, the Cardinal will be the Pac-10 representative in the Rose Bowl come January. Selection of BCS bowl series matches are explained here. With each Forty-Niner loss, the Harbaugh option looks ever more attractive. If Intrade had a prediction market for sports, the price of Harbaugh becoming the next Forty-Niners coach would be steadily increasing. A growing body of academic literature suggests that uneven distribution of economic gains may be troublesome for democracy. Using IRS data, Professors Thomas Piketty (Paris School of Economics) and Emmanuel Saez (UC Berkeley) plot the share of pre-tax income flowing to the top 1% of earners between 1913 and 2008. The graph (Figure 2) shows that the share peaked in 1928 at 24%, after which it underwent a steady decline to 9% in 1975 (with some ups and downs along the way in the 1930s and 1940s). The share accruing to the top 1% remained steady during 1976-80. It then rose to 16% in 1988 at the end of Reagan’s presidency. After falling slightly to just over 14% under President George H.W. Bush, it shot up sharply under President Clinton, peaking at 22%. The dot-com bust reduced it to 17% in 2003, thereafter rising to 23% in 2007, settling at 21% in 2008 at the end of Bush’s second term. Taking the starting and ending points of the Clinton and Bush presidencies, the share of income flowing to the top 1% under Clinton rose 57%; under George W. Bush, it actually fell. Why are these gains and losses important? Some commentators have argued that President Bush’s tax-rate reductions worsened the distribution of income by giving tax breaks to the top 2%. In fact, the top 1% did worse at the end of the Bush’s presidency. In stark contrast, the top 1% flourished under President Clinton. Recall that two new rates of 36% and 39.6% were added to the previous rates of 15%, 28%, and 31% in the Clinton years. On this evidence, it’s hard to argue that restoring the Clinton rates is required to improve the distribution of income. Global buyers of rare earth metals complain that China is restricting its exports to Japan and other countries. Rare earth metals are vital inputs in telecommunications equipment and other high-tech products. China has suspended shipments to Japan during the past month over a dispute of offshore islands claimed by both countries. Since 1990, China has supplanted the U.S. and increasingly dominated the production of rare earth metals, now producing 97% of global output. It will take the U.S. three years to begin mining and processing large quantities of rare earth metals to reduce dependence on China. If China is willing to punish Japan over several uninhabited offshore islands, image how it might react to the U.S. Treasury naming China a currency manipulator (not to mention China’s massive holdings of U.S. treasuries). These measures pale against what will be China’s ability in 2020 and beyond to initiate or take retaliatory economic actions against countries that threaten China’s interests. Is There an Iraqi Government Somewhere in Our Future? Seven months and counting since the March 7, 2010, election in Iraq, a new government has yet to form. As if that weren’t bad enough, Nouriel al-Maliki, leader of the Shi'a bloc, flew to Iran on October 18, 2010, to meet with Iran’s President Mahmoud Ahmadinejad, Supreme Leader Ayatollah Khamenei, and Moqtada al-Sadr, a powerful Shi’a cleric, who wants all U.S. forces out of Iraq immediately. Maliki stressed that Iraq’s ties with Iran is at the top of Iraq’s relations with other countries. Eight years since the 2003 invasion, a trillion dollars, five thousand dead soldiers, several tens of thousands wounded, and the remaining 50,000 U.S. troops scheduled to leave Iraq by the end of 2011, the prospect of a stable democracy in Iraq supportive of U.S. interests appears increasingly dim. What may emerge in its place is greater cooperation between Iran and a Shi’a-led government in Iraq that includes al-Sadr’s bloc. Such an outcome would be a severe setback for U.S. foreign policy. The composition of Stanford’s student body has dramatically changed since I first set foot on the campus on September 4, 1971. The student body, both undergraduate and graduate, was largely white. Campus activism arose from opposition to the Vietnam War and the draft. During the next 30 years the complexion of Stanford steadily changed, reflecting increased enrollment of female and minority students and gradual hiring of female and minority faculty. During this period, faculty and California resident students overwhelmingly registered as Democrats, routinely voting four-to-one for Democrats in national elections. Students actively organized during national elections and brought candidates to campus. All is quiet on the Western front this year. Walking around the campus yields little evidence that this is an election year. Moreover, drab blue jeans have given way to skirts and floral dresses among the student body. Students from Asia and of Asian descent constitute two-fifths of the student body, who tend to be more conservative and less active in politics. While the faculty still largely supports liberal progressive policies and causes, the student body shows less and less interest in the message. The recent Stanford Daily editorial board rant against Victor Davis Hanson, and by implication the Hoover Institution, brought forth hundreds of responses, almost all critical of the editorial board. A day before his long postponed visit to Indonesia, President Obama made a brief statement in the White House Rose Garden. Republican leaders rushed to their microphones to state support for policies based on common ground. However, Republicans heard the voters loud and clear, meaning that Obama would have to respond to the peoples’ concerns. He would be wise, they stated, not to push unpopular policies through a lame duck Congress if he wanted Republican support during the next two years. Environmental scientists warn that heavy use of fossil fuels, which produces greenhouse gas emissions, global warming, and disruptive climate change, threatens the planet and human existence itself. Dependence on fossil fuels will continue for several decades or longer until cost-efficient renewal fuels become more readily available. A distinguished group of economists, including several with Nobel prizes, maintain that more stimulus, monetary and/or fiscal, is required to increase aggregate demand, thereby closing the output gap and putting millions of unemployed Americans back to work. Is this a wise course of action? There is a side benefit to high unemployment, namely, reduced consumption of fossil fuels that ameliorates disruptive climate change. The U.S., with China and India, are the big three emitters of greenhouse gases. With a much higher standard of living in the U.S. than in China and India, perhaps the U.S. should do more than its proportional share of reduction in greenhouse gases. Moreover, the reported stagnation in middle-class incomes may also help to hold down emissions of harmful pollutants. A small but growing body of research suggests that more money does not yield greater happiness. This might be an appropriate time to weigh the costs and benefits of increasing aggregate demand in terms of its environmental impact. The political-economy blogosphere is replete with arguments that India’s economy will catch, and perhaps surpass, China because of India’s democratic political system. Who’s kidding who? Take electricity production. In 2009, China produced 3,714 billion kWh compared with India’s output of 665.3 billion kWh. Total installed electricity capacity in China was 874 GW vs. India’s 162 GW. China’s output and grid are both five times greater than in India. In 2009 China’s increase in electric grid capacity was 93 GW compared with 31 GW in India. China’s one-year increase equals 57% of India’s entire grid. To this comparison can be added transportation indicators, industrial output, and so on. There is nothing wrong with stating a preference for democracy, but it is quite another matter to claim its superior economic performance in the China-India comparison. In apparent response to NATO forces killing three Pakistani soldiers (for which Hillary Clinton has now apologized), and perhaps to Hillary’s demand that rich Pakistanis pay more taxes, Pakistan has closed the Torkham border crossing into Afghanistan through which 70% of ground supplies are delivered to NATO forces. In the past seven days, 127 fuel tankers have been blown up. Strange behavior from Pakistan, which is supposed to be an ally of the U.S. and NATO in the fight against Al-Qaeda and the Taliban, don’t you think? When will a shortage of fuel tankers develop? When will the reduction in fuel deliveries hamper NATO operations? Who is paying the insurance and compensation for property destruction and to families of killed and wounded drivers? What will it take for Pakistan to reopen the border crossing? Money? An end to NATO incursions into Pakistani territory? An end to complaining about lackluster efforts to root out Taliban fighters on its territory? 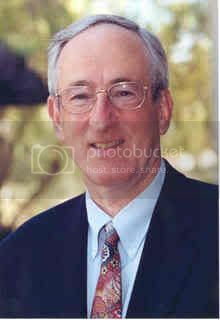 Nobel Prize in Economics winner Robert Fogel projects that the Chinese economy will reach $123 trillion in 2040. His analysis challenges commentators who predict that China will crash, stagnate, or slow down. Anyone interested in China's economic prospects should read Fogel's essay. Some economists and politicians advocate more stumulus on the view that more government spending is necessary to increase aggregate demand to create jobs and reduce unemployment. Critics of further stimulus worry that cranking up the government printing press to print more dollars risks inflation. The critics can put their hearts at ease. The Federal Reserve Board was set to release the new $100 bill on February 10, 2011. Unfortunately, the special paper on which the currency was printed creased during passage through the Bureau of Printing and Engraving's high-printing machine. On October 1, the Fed issued a press release announcing the problem and delay until further notice. No matter. The Bureau cannot print $100 bills fast enough to stimulate aggregate demand, as a majority of them ultimately circulate overseas. To really stimulate demand, the Bureau should resume printing $500 and $1,000 bills to put real purchasing power in the hands of American consumers. Oh no! Another illegal alien employed by a political candidate. Despite spending over $130 million on her campaign, this slip could put Jerry Brown back in the governor’s mansion in Sacramento. Anyone with the slightest future interest in elective or high appointive office, who employs a housekeeper, nanny, gardener, cleaning woman, and other household help, or a company that employs any of these personnel, should require proof of legality of the individuals in question and then double check the proof for fraud. Valid documents include work permits, green cards, and U.S. passports. Since these documents can be forged, they should be reconfirmed with the appropriate federal agency and backed up with notarized copies. In short, anyone with political ambition should take protective measures (but be careful to avoid charges of racial profiling). Never mind how many Latinas/Latinos lose their source of income. 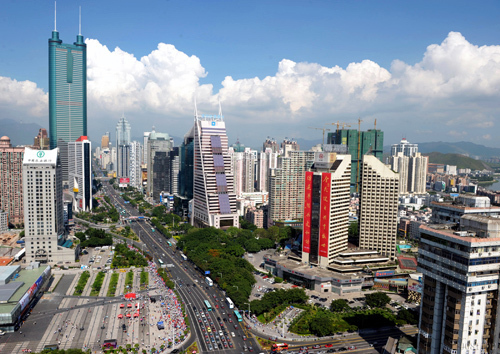 China’s great economic reformer, the late Deng Xiaoping, launched his country on a path of three decades of 10% annual economic growth when he established the first Special Economic Zone in Shenzhen in 1980. The Shenzhen SEZ has just celebrated its 30th anniversary of success. I traveled to Hong Kong almost annually between 1976 and 1994. In Hong Kong’s rural New Territories, there are vantage spots from which one can catch a glimpse of Shenzhen. What I saw in the 1970s was a small fishing village. Contrast that with an ultra-modern city today of 9 million, the richest city in China with per capita income of US$13,600. A comparison of the photos shows what 30 years of sustained high growth can produce. Put your imagination to work and you may be able to visualize what most of China will look like 20 years from now. The Bill Walsh era of the San Francisco Forty-Niners (1979-88) brought San Francisco Bay Area residents three Super Bowl champions. It was a glorious time for football fans and businesses in the Bay Area. Walsh previously spent two years on the Farm (1977-78) coaching the Stanford Cardinal to wins in the Sun and Bluebonnet bowls. This year head coach Mike Singletary of the Niners is off to a rotten 0-3 start. How many more years will the Niners wait for Singletary to produce a winner. Might the Niners turn to Stanford head coach Jim Harbaugh, who has transformed Stanford football into a tough winning program, just a few miles south on the Farm. I expect the Forty-Niners will make Harbaugh an offer he won’t refuse when the NFL season ends this year. If so, a great loss to Stanford could be an even bigger gain to the Forty-Niners and the entire Bay Area.